Including Sagamatic 2, Series 5, Dartsmate 3, Bingo Blowers and many more. Bingo Bingo Supplies stock a wide and varied range of Bingo Machines, including all the most popular models of both traditional & electronic bingo machines.There are many different types of Bingo Machines available, from traditional cage-style machines to highly sophisticated electronic versions and bingo blowers. The traditional style generally consists of a cage which is turned manually and the balls drawn at random. 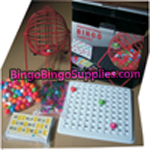 They are more suitable for smaller bingo games and are perfect for playing bingo at home. The modern electronic machines are automated and are programmed to select numbers at random. They are more professional than the traditional versions, and when teamed with a display unit are ideal for bingo halls and community fundraisers. Bingo Bingo Supplies carry an extensive selection of the most popular Bingo Machines on the market, including the Sagamatic 2 Bingo Machine. We also supply an array of Bingo Accessories, such as extra balls and trays for our traditional bingo cages, display units for our electronic bingo machines, checkboards, shutterboards and bingo clipboards. 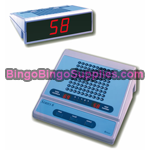 Bingo Bingo Supplies provide Bingo Equipment for a number of Bingo Halls, Events and individuals nationwide at competitive trade prices, and can handle any order large or small. 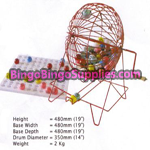 Whether its a personal order of a Home Bingo Set or a bulk order of Bingo Tickets and Bingo Dabbers for a Member's Club, Bingo Bingo Supplies can meet your requirements. Bingo Bingo Supplies offer competitive rates of delivery to all European and Worldwide destinations. If you would like to set up a trade account please contact us to discuss. 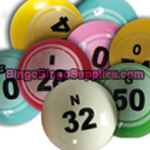 Below you can see a selection of our most popular bingo machines and related accessories. 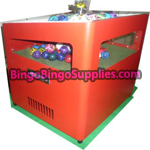 Popular Bingo Machine, Great for Small Clubs and Holiday Camps!